Kelly Medinger joined the Knott Foundation in 2011 and became Executive Director in 2012. In this capacity, she manages the general operations of the Foundation, oversees all grantmaking programs, facilitates good governance with the board, and leads external communications. Kelly has been a professional in the philanthropic sector for more than 15 years. Her experience combines both grantmaking and grantseeking, having served as the Director of Corporate, Foundation and Government Relations at Stevenson University, a Program Officer at The Goizueta Foundation in Atlanta, and an Associate Campaign Manager at Coxe Curry & Associates, a fundraising consulting firm. 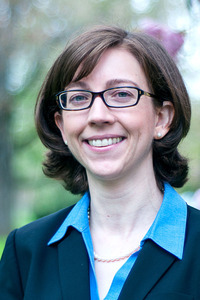 Kelly holds a Masters of Nonprofit Administration from the Mendoza College of Business at the University of Notre Dame and a Bachelor of Arts in Political Science and French, also from Notre Dame. She and her husband, Jason, live in Towson with their son Michael.